This saturday at Boardwalk Hall, Atlantic City, N.J., maestro Bernard “The Alien” Hopkins 55- 6-2 (32KO) will attempt to conduct a clinic highlighting his knowledge, experience, good judgement and discipline. No other boxer in history has successfully accomplished what he has. He is the consummate artist. Only weeks away from his 50th birthday, in exemplary fashion, he will climb into the ring with the “Krusher”, Sergey Kovalev 25-0-1 (23KO). At 31 the Russian is still a whippersnapper to Hopkins. The wise old fighting man from Philly doesn’t view Kovalev that way. He looks at him and sees opportunity. In a view not unlike Evander Holyfield’s fight with Mike Tyson. Most people didn’t look at the whole picture. There limited view point stopped with recognition of Tyson’s fearsome power. Such power was frightening and magnetic for fans and nerve-racking for his opponents. Many of his opponents were whipped before they touched the canvas. Holyfield wasn’t alarmed. There wasn’t any fear or anxiety within him. He remained relaxed and at ease with the knowledge that Tyson’s strength was also his weakness. The Real Deal was actually impatient to demonstrate he was right in his belief. In hindsight, it seems simple, something most fans have since heard, and most experts have tried to have register with their pupils. That simple truth is a fighter is most open when he is punching. Proper counter punching should be the answer, right? 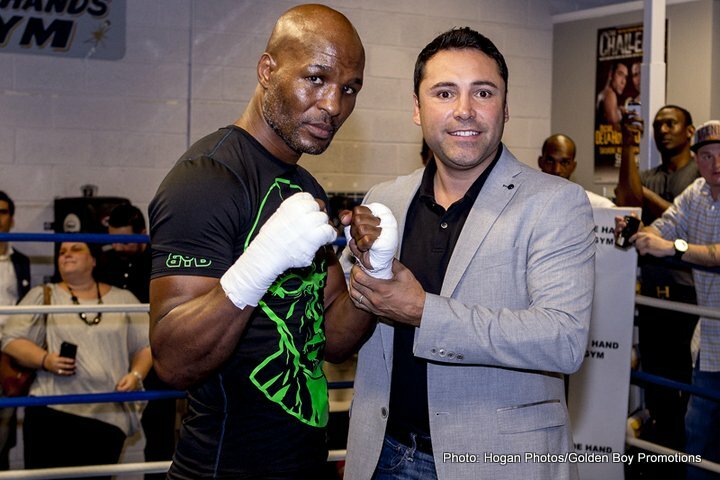 With Holyfield and Hopkins, there’s one additional element that most fighters lack. It’s courage, steady nerves and faith in one’s own ability. Couple that with skill and you’ve got Bernard Hopkins. “Wait a minute”, you might be saying, “Don’t all fighters have to be courageous just to climb into the ring?” The obvious answer is yes. However, there are degrees of courageous. Unfortunately, there are too many eager participants that step into the squared cycle that anticipate things are going to be easy and will go their way. As the old saying goes, once their hit with a good shot, those expectations (fight plans) fly out the window and then these fair weather pugs start looking for a way out themselves. Hopkins isn’t one of those guys. He, like Holyfield, has the fearlessness to carry out what he knows is the right strategy. In addition, he still has the technical skills, and conditioning to go along with that knowledge. He definitely demonstrated it by beating Kelly Pavlik, Antonio Tarver, Jean Pascal, Oscar De LaHoya, and Felix Trinidad. However, he too has had bad moments, those contests when he could be seen faltering. Fans wondered whether it time caught up with him? Pre-fight banter leading up to those losing affairs had him promising all the right things. but when it came time to execute, there was a hesitancy. He was shilly-shallying, like dragging one’s foot. To put it into common parlance, it is like those times when we know what needs to be said, but we can’t get it out. We stammer and stutter. When that happens, It’s awkward and disconcerting. In boxing, it’s the beginning of the end. Hopkins had such moments; although he would argue the point, against Jermain Taylor and Chad Dawson. After the first loss to Taylor, Bernard vowed to be busier in the rematch. No matter how many times he said it, he couldn’t make it happen. So, there is a weak link in the old man’s chain. Whether Kovalev can take advantage of it is the key? The Krusher is confident in his ability. Primarily, he is a knockout puncher. He is not a volume puncher, but he does apply pressure and punches in combinations, both to the head and body. He makes use of a long hard jab to the body. It is a formidable weapon. Hopkins will attempt to keep Kovalev off balance with side to side motion. He’ll change up the tempo and might toss in a lead right, now and then just to keep the Russian honest. When he feels the ropes touching his back, he won’t go into a shell. Rather, he will come forward and tie up Kovalev. If the Russian doesn’t have a plan on how to deal with that tactic, he will become frustrated and waste energy. If that happens, and Hopkins senses it, he will will seize the opportunity, and start to punish the man from Oblast. Obviously Kovalev is no Jack Dempsey, nobody is. But, if Kovalev can at least live up to some of his publicity, then there’s hope he might prevail. He hopes to see a breakdown and collapse of the forty-nine year old coot. He knows he is faced with beating a legend, a fighter never stopped, who is beyond just experience. Sergey knows this is a cagey, wily veteran, someone who has managed to do what no fighter has ever done before. He is unbelievable, and Sergey knows Bernard is beyond just shrewd, that he is a rascal, a scheming and devious rapscallion, who is not above using the top of his head or the point of his elbow to inflict pain. Kovalev is well aware of all that, yet he believes he is going to win. Could this be the closing act for Bernard? Is he going to have to come up with another character. First, there was the Executioner, then the Alien. It’s obvious Bernard will never be ordinary or commonplace, but if we give him enough room, he might find it necessary to surprise us with yet another stellar event, and epoch.